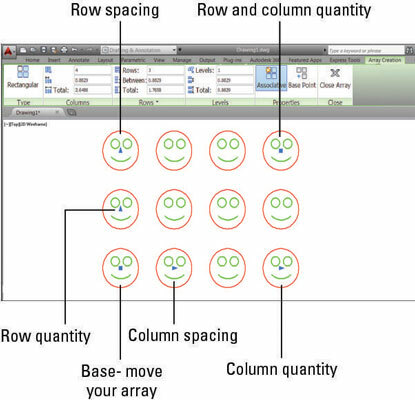 When associative arrays were introduced in AutoCAD 2012, many reviewers were startled to see that the dialog box used for simple arrays had gone away and seemed to be replaced by command line input, just like the good old days. The disadvantage to command line input is that you must follow a step-by-step sequence, and if you make a mistake, you have to cancel and start over again. The good news is that the ARray command displays a live preview so you can see exactly how your array will turn out. The bad news is that AutoCAD 2012’s interface was a little clunky, much like the old command line version. The good news is that it was improved in 2013. The following steps show you how to create multiple copies of a set of drawing objects, neatly arranged in a grid pattern of several rows and columns. Open a drawing containing some objects you want to array, or draw some simple geometry for your source objects. Click Rectangular Array from the Array drop-down button on the Modify panel of the Home tab. Choosing the specific array type from the drop-down list saves you from answering one prompt you’d get if you used the ARray command. When drop-down lists are available, the Ribbon remembers the last selection chosen. The Array button may show any one of three different icons. If you like the one that’s showing, you can simply select it instead of initiating the drop-down list. At the Select Objects prompt, select one or more objects that you want to array. The Ribbon changes to display the Array Creation contextual tab. Enter the number of rows and columns of your source objects that you want to be arrayed and also their spacing. When AutoCAD 2012 introduced associative arrays, many people commented on what appeared to be a regressive step away from a dialog box and back to command line input. The good news is that AutoCAD 2013 gave you most of the advantages of both methods but few of the disadvantages and added yet another variant: the Ribbon. As you play with the following options, observe how the dynamic preview constantly updates. Row 1, column 1: Base. You can move your array to a different location as you create it. After you select this grip, you can drag and drop it to a new location (object snaps work), or you can enter X and Y values at the dynamic cursor prompt. Row 1, column 2: Column spacing. Drag this grip (or enter a value at the dynamic prompt) to change the spacing of all columns. You can enter a negative value, or you can drag to the left of row 1, column 1 to make your array grow in the opposite direction. Row 1, column 4: Column quantity. Drag this grip (or enter a value at the dynamic prompt) to change the quantity of columns. Column 1, row 2: Row spacing. Drag this grip (or enter a value at the dynamic prompt) to change the spacing of all rows. You can enter a negative value, or you can drag below row 1, column 1 to make your array grow in the opposite direction. Column 1, row 3: Row quantity. Drag this grip (or enter a value at the dynamic prompt) to change the quantity of rows. Row 3, column 4: Row and column quantity. Drag this grip (or enter values at the dynamic prompt) to change the quantity of rows and columns at the same time. Check out the other methods of specifying your array. The AutoCAD 2013 changes to the Array feature gave you three basic methods for defining your array, one of which is grip-editing. The interesting option is that the command line continues to show almost all the prompts. Typically, command line input forces you to follow a specific sequence, but ARray in AutoCAD 2014 allows you to enter any command line option at any time. The Ribbon displays the Array Creation contextual tab while you’re defining your array. At any time, you can enter specific values, but it has an extra functionality: The Columns and Rows panels each have a Total field, meaning a total distance. If you enter values in either window, the column and/or row spacing will be adjusted so that the number of rows and/or columns fit exactly within the specified distance. If you don’t have a grip selected, the default mode is eXit. Simply press Enter or the spacebar, or click the Close Array button on the Ribbon, and you’re done! The Rows panel of the Array Creation contextual tab of the Ribbon includes options for vertical (Z axis) values. If you’re working in 3D, you can easily create a set of bleacher seats, for example, where the higher-numbered rows are at a higher elevation so everyone gets a good view.